We wanted to show in a small way our appreciation for your love and support over the years. This letter and certificate of appreciation are reminders of how dear you are to us. As we look back over the years, God and all of our supporters have been very faithful. Back in May 1986, we graduated from Milligan, got married, and moved to Texas all in the same week. We got whatever jobs we could find, and three months later we began studying linguistics and anthropology in preparation for the mission field. Our studies took four years since we both worked full-time jobs. But the Lord even used those job experiences as preparation for the field. "Partnership Development" (support raising) proved quite challenging as we found ourselves in a "Catch 22." Brad quit his full-time job, but after three months of traveling and interviewing, there was only $200 a month mission income to replace his salary. It seemed several contacts wanted to meet Tammie, who was still working, or they wanted to begin support when we left for the field. After about a year, we were able to rent out our house, and Tammie could finally quit her job. Though we still didn't have much mission income and no jobs, we felt a real freedom in having no monthly bills. Our biggest adjustment was going from only seeing each other every few days, because of different work shifts and class schedules, to being together 24 hours a day in the cab of a small pick-up truck. Some of you have known one of us since we were kids. Others met us while driving around in that S10 from church to church and camp to camp. Our attitude was that the Lord had called us to the mission field; therefore, he had called others to partner with us. It was just our job to find them. Today, all of you are an integral part of our ministry; we are partners in this work. We finally left for French school in Besançon, France in January 1991. After seven months of intensive course work, we returned to the US for five months to find a few more partners to meet our budget for living in Zaire. Despite news that missionaries were evacuating Zaire, in January 1992, we left for Africa. After attending the three month Africa Orientation Course in Cameroon, West Africa, we arranged to stay there and do a six month internship in socio-linguistic surveys with Wycliffe Bible Translators while we waited for the situation in Zaire to calm down enough for the missionaries to return. After the internship, we were invited to help staff the next orientation course. When the small bush plane finally landed in Bomili village in Northeastern Zaire (now the Democratic Republic of the Congo) in December 1992, Tammie had an overwhelming sense that we were "home." Two years later, we traveled back to the United States for a one-year furlough, never to return to a country called Zaire. We thought we would be working there for ten to twenty years, but church politics and civil war forced us out before our work was even well established. Bradley Jr. was born early in this first furlough. We had waited nine years to have children, until our lives were more settled. Instead, we lost our home, our belongings, our ministry, and our dream of giving the Bible to the Bali people. During our two year "extended" furlough, while we sought another country to work in and Brad finished his Master's Degree in Linguistics, you stuck with us. Our level of monthly financial support actually increased. So many of you have supported us consistently for such a long time! Some give from a very fixed income, and that has kept us mindful of how we use every dollar. We hope that each time you write a check and send it, that it never becomes mechanical or dull or a burden. We want you to realize what a tremendous blessing you are to us, our children, our colleagues, and the people whose lives have been saved because of your generosity, and whose children's souls will be saved because of the eternally valuable work we are daily struggling to accomplish. We know that the struggle is not against flesh and blood, but the powers and principalities that oppose our work often manifest themselves in flesh and blood (and delays, paperwork, breakdowns, confusion etc.). We yearn for progress and accomplishment, yet they are often so slow in coming. We remind ourselves that giving up would be fatal for many who are waiting on God's Word, or waiting to learn how to read God's Word for themselves. Strategically speaking, we believe that the combination of Bible translation and literacy is the most effective tool to equip the Church to multiply and to withstand the onslaught of other religions as well as syncretism and apathy within the Church. In early 1997, after three months helping staff the orientation course in Cameroon again, we arrived in Tanzania as part of the start-up team for the new PBT East Africa Branch. We were to lead the initial socio-linguistic surveys; however, our first priority was to learn yet another language: Swahili this time. Tammie finished her Master's thesis and degree in anthropology. We took a three-month "break" in Zimbabwe to have our second child, Moriah. We were still able to see ten surveys completed by the end of our term, and the branch participated in two years of famine relief for local people. At the end of our term, the branch prioritized projects based on the survey results, and God made it clear that we needed to move to Morogoro to begin Bible translation and literacy programs. In April 2001, after returning from a one-year furlough, we moved to the town of Morogoro. Currently, Brad is the Associate Director of Language Affairs, overseeing "all" language programs. Our first program has just begun among the Kaguru people in conjunction with United Bible Society. Tammie is the Anthropology Consultant, branch hostess, and fills in other branch roles as well as serves as a trustee for a street children's ministry. Instead of reading things in our newsletters like "72 people were baptized" or "Two more church buildings were dedicated," you read things like, "We discovered four new vowels" or "Brad is attending a Bantu language workshop." The Word of God presented clearly and accurately in the heart language of people is the foundation for indigenous pastors to baptize new believers and build churches long after we missionaries have gone. So our role is primarily one of disciplining and encouraging the Church to maturity. We have learned from experience the importance of training nationals to stand and continue the work on their own, as we have no guarantees of how long we may serve in a country with the quickly changing political situations throughout Africa. This work is an investment that pays huge dividends for years and generations to come. The Lord has called us to effect a change in one Tanzanian's life in yet another way. 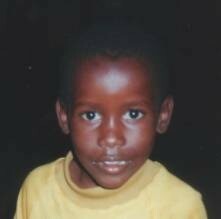 We have just welcomed a Tanzanian child into our family. He is a five-year old boy named Yuda (Judah) who has lived in an orphanage since he was one week old. (We are in the process of completing the required three months of foster care before continuing with the adoption process.) In a similar way, you have adopted us. Thank you for your partnership, your friendship, your encouragement, your sacrifice, your example, your love for the lost, and most of all, your love for the Lord, which has resulted in you answering God's call to invest with us in the work of Bible translation. God told Abraham, "I will bless you; …and all peoples on earth will be blessed through you." Through Christ's redemption, we are adopted children of Abraham and heirs of this promise (Galatians 3:7-9.) Everything that God has given us is ours to share; most importantly, the gift of our salvation! Our words are not always adequate to share this gift, but God's Word never fails to hit it's mark.